The room booked was a standard room with a king bed, a fridge, a coffee maker and a microwave (big plus because most hotels don’t give you these). Upon arrival we noticed the AC wasn’t working, i called the front desk and they sent somebody to replace the battery immediately. In the morning the hotel has a free breakfast which consisted of waffles, coffee, juice and bread. It’s a good option if you want something to hold you over until noon but not a full on breakfast which we were fully aware of. The little breakfast room is right by the pool area which is very convenient if you will be swimming in the morning. The pool hours were 8am-10pm, with the Palm springs heat having the pool open that early was great because we were able to catch some rays before it got too hot to stay still. The location of the Royal Sun was also ideal for us because it was only a 7-min cab ride ($7) away from the main strip where all the bars, casinos and restaurants are located. It is also located across the street from a liquor store which makes it easy to go get snacks or drinks during your stay. The staff was really helpful in anything we needed help with and that can always make or break your stay, regardless of how much you spent in the room. 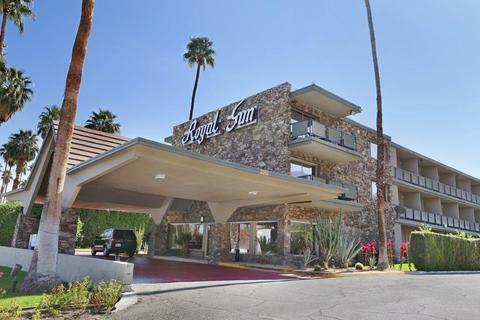 If you are looking for luxury hotel with high thread count in their sheets and big chandeliers you wont find it at the Royal Sun, the rooms are standard hotel rooms. However, it isn’t a hole in the wall type of location either. I highly recommend this hotel if you want a good place to lay at night to rest and in a good location without being right on the strip. *Pool has a small Jacuzzi on the side, there is also a small BBQ area with tables and shade.